1611 quarto of The First and Second Part of the troublesome Raigne of King John of England, falsely attributed to "W.Sh." First official record: Francis Meres' Palladis Tamia (1598), referred to as "King Iohn." First published: First Folio (1623), as The life and death of King Iohn. First recorded performance: although numerous references to the play throughout the seventeenth century indicate that it was performed with some frequency and success, there is no definite record of any specific performance. The first documented performance was on 26 February 1737, produced by John Rich at Drury Lane. Evidence: King John can be a difficult play to date due to the lack of any real external evidence or internal topical allusions. 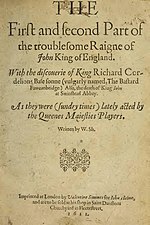 Scholars have instead been forced to rely on stylistic evidence, and speculation regarding the play's relationship with the anonymous two-part play The Troublesome Reign of King John (c.1589), which was published in 1611 and 1622 under Shakespeare's name. King John was obviously in existence by 1598, as it is mentioned in Palladis Tamia, and most scholars agree that Shakespeare used Troublesome Reign as a source, meaning it must have been written after 1589. In his 1954 edition of the play for the second series of the Arden Shakespeare, however, E.A.J. Honigmann argues that Troublesome Reign is actually an adaptation of Shakespeare's King John based on the recollections of a performance, and hence King John was written prior to 1589. Although most scholars disagree with Honigmann on this point, the exact nature of the relationship between the two plays remains open to question. Stylistic evidence serves to locate the play in the mid-1590s. Both a rare word test and Ants Oras' pause test place it after Richard II. A colloquialism-in-verse test places it prior to the two Henry IV plays. All three of these plays were definitely written during the 1590s, suggesting King John must also have been written in that decade. Furthermore, Barron Brainerd's statistical analysis of Shakespeare's plays places King John just past the mid-way point of the decade, after Richard II and prior to Henry IV, Part 1.